Time flies when you are still looking for summer to happen. We have had a pretty cool spring but that has not stopped us from getting out and doing things in our neighborhood. It was two weeks ago that we hosted three events for the Jane’s Walk weekend. Altogether, there were 19 walks in Kitchener and several more in Waterloo, Cambridge, Stratford and elsewhere in the region. MHBP is proud to have hosted walks for six years in a row! You can search this Blog for “Jane’s Walk” for pictures of past events. This entry describes some of the history behind the walk. This year started out with Wayne’s excellent Mount Hope Cemetery walk. 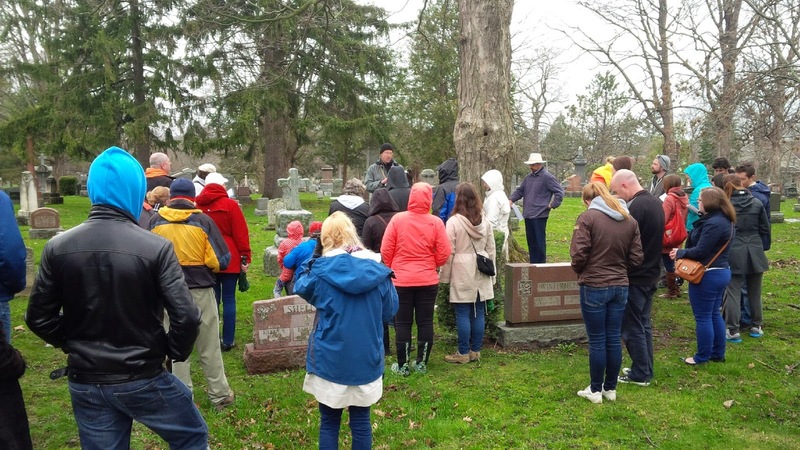 Wayne has done this for a few years now and has a fascinating way of weaving together many tales of Kitchener’s historical figures as he leads the group from one gravesite to another. In fact, as the walk progresses the plots thicken! You can see that a little cool weather and rain did not stop the hardy group from learning about Kitchener’s history including the story of the $50 “jog” in Queen St. The second neighbourhood walk was actually a bike ride led by Chris through many of the historic buildings around our area. This was a new idea this year and allowed people to see more locations and get an idea of how large the Mt Hope – Breithaupt Park area actually is. Our final walk went from “East to West” (although, with street directions in Kitchener/Waterloo as idiosyncratic as they are, this might be open for debate). Lane and Ted led a group through a discussion of Kitchener history which also bumped into, and confronted, the dramatic present. We started by the former shoe factory at the corner of Breithaupt and St. Leger. Ted discussed the history of the Breithaupt Park area as Kitchener’s “industrial suburb”. We think of our area now as “downtown” or possibly “midtown” but its origin is as a suburb on the edge of the city with a dynamic history manufacturing shoes, furniture, rubber, leather, buttons and many other products. Lane talked about how this building had been “reinvented” over the years with different tenants and now houses many types of businesses. Of course a Jane’s Walk always involves….walking! One of the most rewarding parts of these trips through our community is the opportunity to talk and interact with neighbours as we go from one stop to the next (yes, you are allowed to bring dogs and bikes on a Jane’s Walk). We continued along Breithaupt Street until we came up against this dramatic reminder of the present. Weber street is being widened to four lanes and is due to be completed by the end of the year. Breithaupt Street will no longer cross Weber because of the latter street’s lower elevation as it goes under the railway tracks. There are many positive elements to the design although the Region has provided very little information about what the area will look like. The latest newsletter describing the project is located here. Below is a photo of the Rumpel Felt building. This original 1913 building has been designated historic and will be incorporated into the planned Kitchener Transit Hub. The newer addition (on the left of this photo) will probably be torn down. So far, the city has given us no rendering of the proposed hub, which will close off Waterloo street so it will no longer connect with Victoria. The Beohmer Box building was once one of ten Dominion Electrohome factories in the Kitchener area. Boehmer Box was founded in 1874 and made boxes for the many button factories in our city (Kitchener was the “button capital” of the world at one time). Beohmer Box is now located on Trillium Drive in Kitchener and makes boxes for Loblaws, Sobey’s and Walmart. This structure is an excellent example of a “non-gentrified” building which houses many different businesses including a martial arts studio and several artist’s studios. We finished our walk at the Breithaupt Block (below). Over the years the many buildings that have made up this structure have housed Berlin Piano and Organ Co, Merchants Rubber, Dominion Rubber and Collins and Aikmen. It has been re-invented as a modern office building with several tech firms renting space. Its most famous tenant, Google, will move in later this year. We were lucky enough to get a tour of the buildings prior to their renovation and posted photos on this Blog. The MHBPNA sponsored refreshments and food at the end of the walk where many of us had some coffee, ate some veggies and talked about our area. The Mt. Hope – Breithaupt Park Neighbourhood is diverse, exciting and has a fascinating history. Jane’s Walks are an opportunity to share this history and meet our neighbours. See you next year! Thanks to Juanita and Jack for the photos.